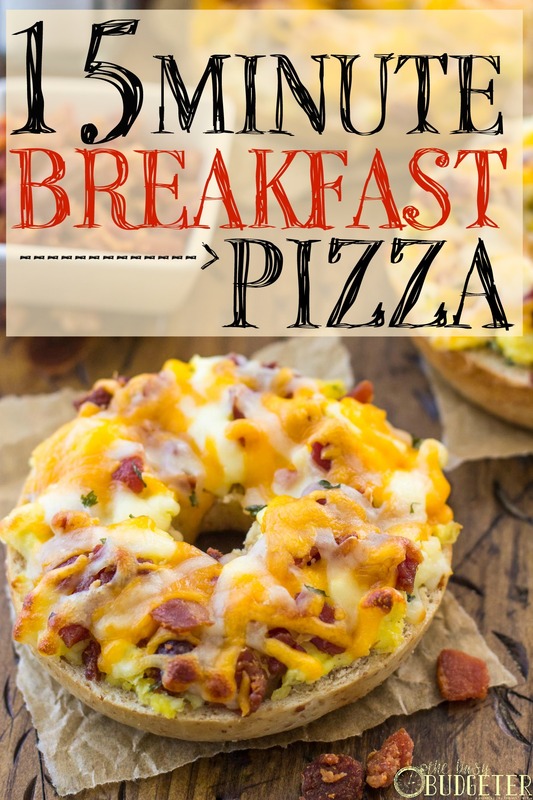 These 15 minute breakfast pizzas are a fast and easy breakfast option! Recently, though, I’ve resolved to do a lot more home-cooking and a lot less sugary cereal-buying. 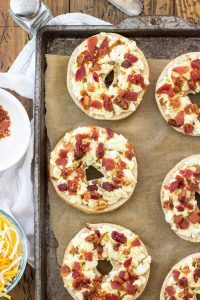 These breakfast pizza bagels have rocked my breakfast routine — they’re a great way to have a home-cooked breakfast in under 15 minutes. 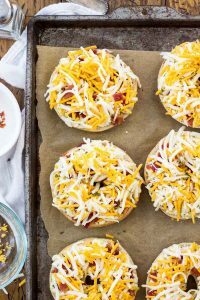 These mini breakfast pizzas were inspired by one of our favorite breakfasts around here, but I love that these are individual, personal pizzas, and as a bonus, they freeze very well, too! 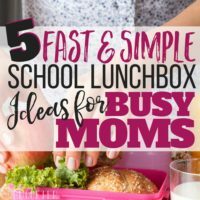 You can spend a little time prepping on the weekends and easily have breakfast for the rest of the week! First, lightly salt and pepper your eggs, add some garlic powder for extra flavor (and a splash of tabasco sauce, if you like a little extra kick), and cook/scramble your eggs in a hot nonstick skillet. No need to add any milk or water! Once the eggs have cooked, evenly sprinkle them over the bagels. Oh, and speaking of these bagels, make sure you always check your reduced racks in your grocery store bakery! These were $1.50 as opposed to the $4 bag in the bread aisle — they had one day left before they expired, but since I knew I was going to be freezing these the expiration date didn’t matter. Now on to the bacon… lots and lots of bacon! 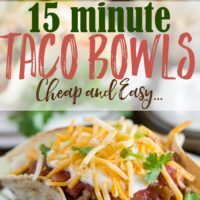 You can cook your own on a skillet or in the oven, but I prefer to save some time and microwave it. Or, you can cheat even further and use pre-cooked bacon crumble pieces, but they tend to be a little pricier. Just sprinkle it over the eggs, as much as you’d like (no judgment here!). And now the cheese (I like where this is going!). 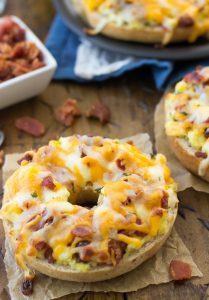 Toss together your mozzarella and cheddar cheese and layer it over the bacon. Add a little dried parsley if you’re feeling fancy. And now on to the oven! Voila! 15 minutes and you’ve got yourself a homemade breakfast! The thing I really love about these mini breakfast pizzas is that they are entirely freezer friendly. 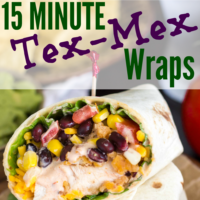 If you’re not going to be eating them all at once, wrap them tightly in saran wrap (I usually also put them in large Ziploc bag or an airtight container, just to be safe) and freeze. These work out well defrosted in either the microwave or in a toaster oven. Place bagels on an ungreased cookie sheet and set aside. In a medium-sized bowl, whisk together eggs, garlic pepper, salt, and pepper. Cook/scramble in a medium nonstick skillet over medium-high heat. 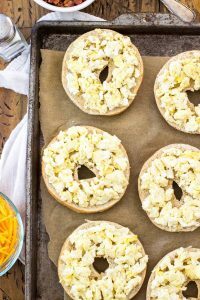 Remove eggs from heat and evenly distribute scrambled eggs over bagels. 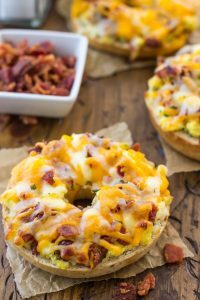 Toss together mozzarella and cheddar cheeses, and cover the bacon/eggs with cheese mixture. Bake at 415° F for 10 minutes. Pizza bagels will be extremely hot right out of the oven, allow them to cool briefly before enjoying. These also freeze very well — wrap cooled pizza bagels tightly in plastic wrap (I usually place them in an airtight container or in a large Ziploc bag for good measure) and freeze. Defrost in microwave or toaster oven before enjoying at a later time. 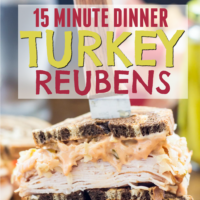 Thanks for sharing this remarkable recipe with us. it looks yummy and amazing. I like this recipes for the fact that it simple to prepare. Now i have somthing special to preapare for my kids this afternoon. i can’t wait to try it out. What an easy and filling breakfast! I am pining this for later! My daughter’s favorite food ever is pizza. She will be amazed at the thought of breakfast pizza! Yummy! Do you cook the pizzas, let cool, the freeze and reheat when you want? Just want to make sure i don’t miss a step!